Got a Farm Blog? #AgBlog it - JP loves LIFE! Surely I’m not the only one who would like to find a more effective way to locate new ag blogs! So I’d like to suggest we start a new hashtag. ( can hear groans from a few folks already & I’m okay with that). It’s only an idea I wanted to throw out for comment and see what folks think but maybe one that would be clearly judged by whether folks adopt it or not. This hashtag would likely be used along with others but would help identify a personal perspective on a topic. So a blog could be tagged with #agblog #agchat and #agproud. Could sound redundant but with different search column runs, things get filled up. What say you ag bloggers and ag blog readers? « High School Graduation Gift Ideas for Ranch Dude? I think this is a great way to streamline information! Good idea! I like it. I will use it next time I post a link to my blog, and it will help me find other ag blogs also 🙂 Good thinking JP! Nice idea JP – anything to help organize, make sense of the flood of info coming at all of us is worth trying. One suggestion. I think everyone should try to keep tweets to this hashtag to a minimum. Only one tweet per blog post. If you do thank you’s or retweets, get rid of the hashtag. Won’t be perfect I realize, but it will be much cleaner if each blog post only has one tweet with the #agblog hashtag. Just an idea..
Matt that looks like an awesome opp. I would love to talk to you more about it! I think it’s a really good idea. Love the thought of streamlining blogs so you can just pick #AgBlog as a trending topic and see everything you’re looking for! I like it! It would help organize, catch new blogs, etc. Great idea. Good idea JP. I would also set up a feed in Facebook through the Social Transcripts app so we can mine the data later. Darin, I can appreciate not wanting to have to much extraneous data points; however, I think not including the hashtag on RT’s kind of defeats the purpose in measuring the reach of blog posts. Knowing how many, and more importantly, who hits the RT button can be of use later as we are measuring our effectiveness. I had thought about that too! Not sure Darin was thinking about RTs but all the reposting later in the day or other days? That may be worth considering. 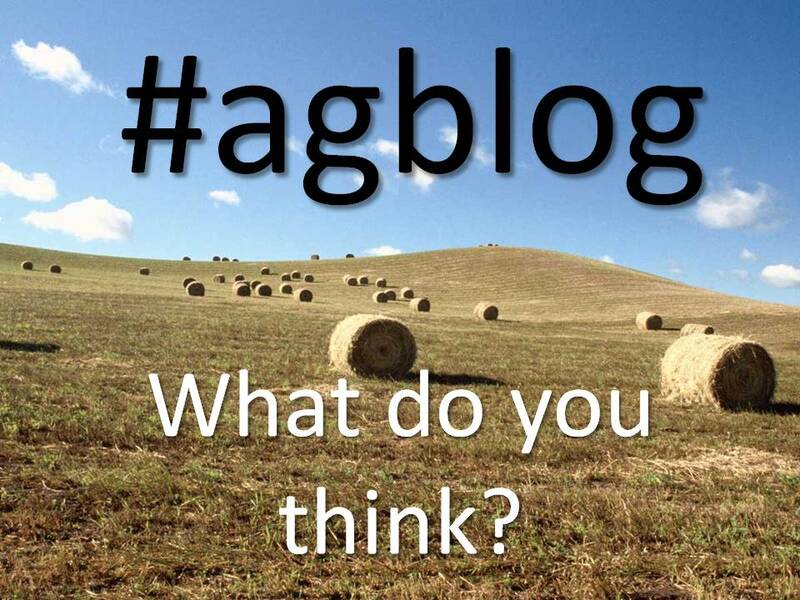 It depends on what you want the #agblog tag to be. If you want it to “promote” your blog, than the more mentions you get for your blog, whether RT’s, thank you’s, whatever, the better. However, I would like to think the #agblog tag could be a bit different. It could be SPECIFICALLY for finding a nice range of ag material.. And a nice way for folks to “check in” on the latest blogs. Not necessarily the folks doing the most “promoting”. In that case, it’s far better to only mention a blog ONE time with the tag. That way folks doing a hashtag search or watching the column don’t have to wade through duplicates. I read somewhere (on twitter of course) that 4 tweetings is supposed to be ideal for reach with a message. ‘Course, then you flood someone who has seen a message already with 3 extra tweets. Sounds good to me! I’m still not 100% sure on how hashtags work….but I’m learning. Hey! I have a blog! The next time I post I will use the hashtag! You can find me and my partner in crime at http://twomaidsamilking.blogspot.com, @kelsayfarms, and Kelsay Farm Tours on Facebook. Thanks! Janice, great idea to capture ag blogs with hashtag. I would start using it today! Also I agree we need to keep using the hashtag on RT’s. I follow @jaybaer & @jlysne advice often on posting blog posts. Both suggest the content/ new blog post needs to be driven through social media outlets 3-5x a day often to reach the audiences you want to connect with and have your content read. Thanks for the taking the initiative to get this hashtag started! Love the #agblog idea.Thanks for thinking of it. I like the idea. Helps those of us who may spend nearly all our time on smartphones easily find blogs. Like it. Reality is that hashtags are a really good way to navigate the Twitterverse. Sounds like a plan to me. I can’t wait to start searching. There’s also an Ag page on Alltop. Why don’t we nominate some new blogs to add to their page? I’d be glad to forward an email of outstanding ag blogs to Neenz at Alltop. That’s a great idea Becky! How do you suggest we go about it? I’d love to find a way to be sure farmer blogs that may not be updated every day but when they do tell the real ag stories get more attention. Neenz, who works with Alltop, has been very responsive when I email her with suggestions. All we need to do is compile a list with blog names, URLs, and maybe a few words of why they are relevant, and I’ll submit them. They don’t have to be updated everyday, they just have to still active and contain interesting content. Now I need to start blogging…ugh where to start??? Here’s a great place to start: Liz Strauss’s Successful Blog. She has a wonderful New Blogger Page. Using #agblog as a twitter hash tag paired with a tweet about an ag related blog (example: “Got a Farm Blog? #AgBlog it http://agtoday.us/bkLXu3 “) is different from a blog post that has been tagged by the writer with #agblog. On re-reading JP’s thoughts above, I think what she is really suggesting is using Twitter to highlight links to new ag blog posts, with the hash tag #agblog being the grouping element. JP’s stated goal is “to locate new ag blogs”. Ag bloggers posting a tweet with a blog link and the #agblog tag will help JP discover new blogs / blog posts: she will most likely setup a TweetDeck column with #agblog as the search term and monitor it periodically. Using #agblog as a tag on a blog post may also help JP, but in a different way. Blog post tags are helpful in organizing content within the blog. For the blog reader, the blog post’s tags are a way to find similar posts on that blog. For the blog writer, the blog post tags are a way to group posts for other purposes, for example creating a page of posts related to “ice cream”. Additionally, most blog tools (WordPress, Drupal, etc.) also provide an RSS feed of their tag terms; the RSS feeds can be plugged into something like Google Reader to help find updated posts for that tag term on a specific blog. The #agblog tag on blog posts may not be as effective in pulling similar posts across many blogs as the method of grouping these posts is a bit more loose, so JP’s desire to discover new ag blogs may fall back to using Google search and that then means more searching work and less discovery, something I think JP is trying to reduce (the search work part :). Interestingly, what JP is trying to do may be better served by identifying selected people who write ag blogs, curating (distilling, boiling down, weeding out, etc) the posts, and then sharing them. She already has started this with the Twitter list http://twitter.com/JPlovesCOTTON/ag-bloggers . This is the very nature of information discovery through out human history: we find people that we like, respect, or consider important to follow and stay connected to them for a period of time. We then share those connections with others, in the hope they will also find them of value. I avoided talking about blog tags as a method to improve search engine optimization as that is a whole other universe:) See http://www.mattcutts.com/blog/canonical-link-tag/ and http://agtoday.us/caUGXL for more details. Shortest Kelly Rivard comment ever. A most excellent idea. I am going to start using it for my blog and will try and get a blog post that shares the information up on my blog here very shortly. Good idea. I don’t blog (yet) but I would use it to find blogs to read. I think it would help sort our timely market and policy news from the more “reflections from the ground” nature of many blogs. Certain tweeters need to cut it out with the obsessive hashtagging. It dilutes the message and looks spammy. You can still include those keywords, but it’s more effective in the form of a sentence. Thanks for coming by. I have a great page of farm blogs here… If you haven’t seen it, you may want to check it out. http://jplovescotton.wordpress.com/blogs-i-read/ — if your blog isn’t listed, leave a comment and I’ll get you on the list! If you are on Twitter look at @AgBlogFeed. All posts are ag related blogs. You should be able to find something that suite your fancy. Nice to meet you. What crops do you grow & where? I can see if any of my American friends grow similar crops & perhaps make the connection for you. Anything with “ag” in it is just going to confuse the issue. There is a vast difference between commercial big ag, and small farms and small farmers, homesteaders, and sustainable farms. If you are going to do something to identify something other than government sponsored big ag, it should be designated with something other than an “ag” tag. Interesting. Do you think farm is more suitable? I don’t think that most small farmers identify with the term “ag”. I mean, they might if they were in FFA, but do you know how UNCOOL FFA is in most schools (and how few even have it anymore). So most people don’t do that in school – they gain the desire later. A lot of people who are doing farm blogs are people who are setting out to do it with very little previous experience, no specialized education in that field, sometimes some family background but not always, they are just tired of living a life that is so disconnected from live things and working and growing food and beauty with their own hands. Many of those who are interested in making the switch are the same. When they go searching, “farm” is the word they use. It is how they think of what they do. If they blog about doing it, wanting it, looking for it, that is how they think. My blog isn’t a farm blog, or an ag blog, or an anything blog. It is just a jumble of who I am. But some of my posts are farm posts, and gardening posts, and farm business posts, and I’d tag them if it helped people who were interested in them find them more easily. Thanks for the input. I’ve never lived in a place that had FFA. We use a few other tags on Twitter, #farm is a big one and on Tuesday nights is #agchat (which gets used a lot outside of that) and one Tuesday night a month is #foodchat (again folks use the tag more broadly). My blog is a lot like yours, a jumble of my thoughts and things I see. I tag posts that have a farm or ag theme with #agblog occasionally just like I use #TTOT for travel posts. Seems to work as I’m interested in talking to all sorts of folks. Sure appreciate your being part of the convo! And looking at your blog, I’m impressed! Not too many bloggers got started in 2006 and have kept going! Kinda funny. I came so late to the blogging arena I just don’t think of myself as having been out there doing it that long! It catches me off guard sometimes. Six years. I guess that is a while in the transient web world.